Only the Buddhist or Vedic scriptures? Is it “natural phenomenon”, like science? Is it only Buddhist ‘truth’? or could it be western secular ‘truth’? Could it be western secular ‘truth’ that happens to be congruent with Asian Buddhism? Or could it be anything that we perceive as ‘true’ or ‘real’? How do we define ‘reality’? Is dharma merely a reification of what is otherwise ordinary factual knowledge (cause and effect, impermanence) moral values or superstition? Is it anything that we venerate as sacred, as having coercive power to make us think and act in particular ways? Is it a collection of norms by which we evaluate aspects of life? Is it the ‘canon’ of authoritative Buddhist scripture? What about the ‘Western canon’? Is that dharma too? Is it a kind of thought experiment that makes us see situations in new ways? 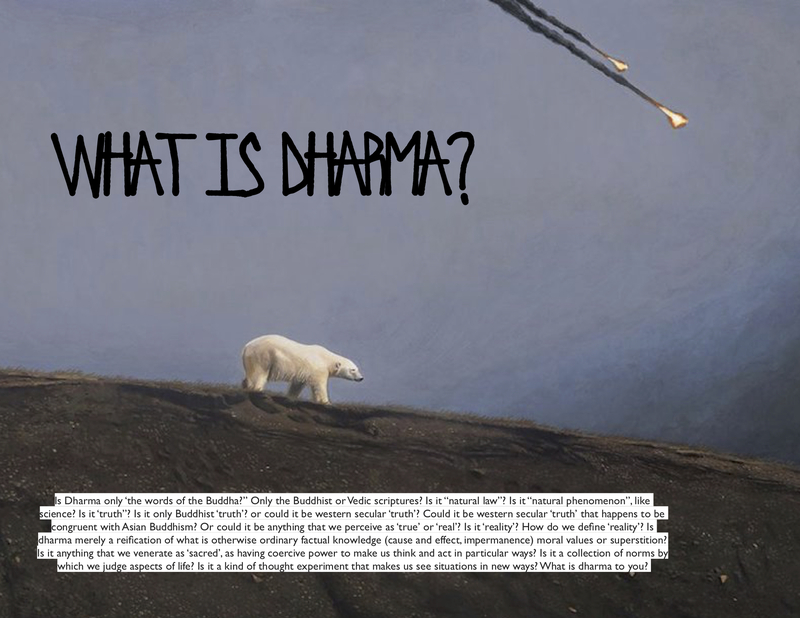 What is dharma to you? A further point is that no dharma, whether orthodox Buddhism or [post]modern dharma, is beyond questioning or critique. All dharma is subject to critical testing. So it almost doesn’t matter what you call it or how you define it; the point is that it must be subject to critique. I have a provisional answer: dharma is governance, in the Foucauldian sense. Glenn Wallis calls it ‘the Magistrate.” It is a potent combination of power-knowledge—dharma, scripture, with discipline— meditation & thought constraints, constraints on speaking and language. For westerners, it operates as the self-governance of the Neo-liberal subject. It operates as a disciplinary regime by delegitimizing and precluding whole categories of thought and speech. One is not allowed to speak, to think, to critique or question the dharma outside of the discipline. One is not allowed to think outside of dharmic categories, to think about, and thereby legitimize, the categories of the ‘other-than-Buddhist.’ As a discipline, not only must one meditate for hours-per-day, without moving or speaking, but even in the presence of teachers, where one is supposedly in a dialogue, one must sit quietly, not move excessively or question anything that is said. The discipline of meditation posture creates ‘docile bodies’ that only receive and never question the power-knowledge regime. This is precisely how innovation proceeds in Buddhism when it is introduced into new cultures. When it was introduced to the West by avatars such as Chogyam Trungpa, he invented a new regime of power-knowledge, ‘Buddhist psychology’, and a new ‘practice’ discipline, psychological introspection and guru therapy, to adapt Tibetan Buddhism to western cultures.